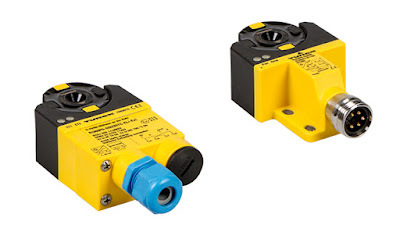 Turck announced two extensions of their inductive angle sensors for rotary actuators. Both new product offerings provide a rotary valve sensing solution ideally suited for harsh environments; one includes a stainless steel Minifast connector and the other, using a terminal chamber, provides ATEX and IECEx approvals. The RI360-DSU utilizes the inductive resonant circuit measuring principle and introduces an innovative open face sensor design for rotary valve sensing. The RI360-DSU open faced inductive angle sensors deliver analog or discrete outputs and provide flexible mounting options previously not available from Turck. Turck’s RI360-DSU inductive angle sensors are able to monitor quarter turn valves and three-way valves, while also detecting the valve position during cleaning cycles. Additionally, the sensors are capable of detecting the wear of seals, thus saving downtime from seals that are worn from switching cycles. For flexible operation, the sensors are available with switching or analog outputs. The RI360P1-DSU35TC-ELI-EXI is available with ATEX and IECEx approvals. The RI360P1-DSU35-ELIU5X2-B1150/S1265 is available with a stainless steel Minifast connector. For questions, or more information, please contact C&E at 800-228-2790. Thank you!